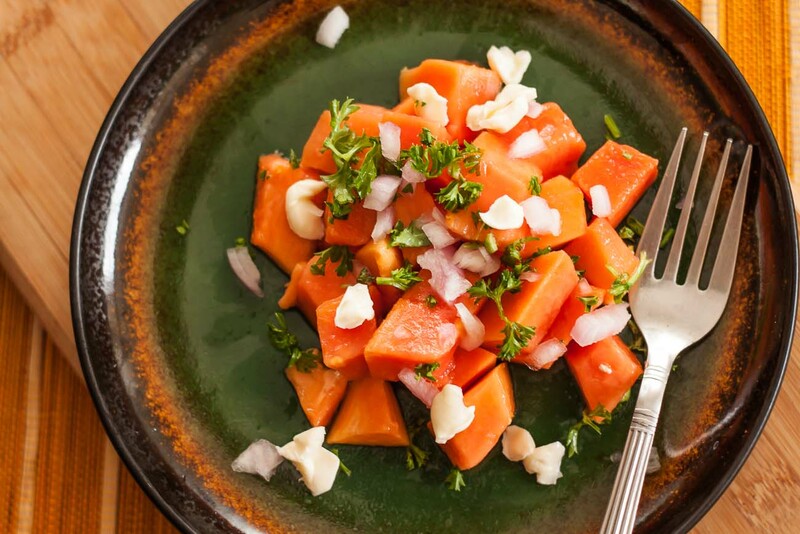 The Papaya Parsley Salad with Cheese recipe is a quick and refreshing salad that makes a weeknight dinner healthy and yet light and delicious. The addition of lemon, feta and peanuts makes this salad easy to make and refreshing for a busy weeknight dinner. Papayas are available throughout the year and is one of the most nutritious fruits. Juicy papayas pair well with sharp onion flavours. You can even fill this salad into a taco and replace the regular salsa filling. Serve Papaya Parsley Salad with Cheese Recipe with Cream Of Mushroom & Spring Onion Soup Recipe for a light dinner.